« Freebie Friday Wk7 – Winner Announced! My piggies would love this because they are always snoozing with their chicken legs poking out in their hammocks! My ‘Happy Piggies’ would love this hammocky hammock to snuggle in and hide in the horrible winter. Munchie chin would love one of these as it combines her two fave things. Hiding and her hammock! Milly would love this hideout because she is very nervous and stressout due to being mistreated and im sure this would make her feel very safe and warm. my three little piggles would love to squish together and have a snooze in this hideout, and dream about their piggy christmas pressies! My little chin Leia has been a part of our family for a month now. She is still really shy and her favorite hideout is a small log. We are waiting on our order from Hammocky Hammocks and we can’t wait to decorate her cage with what we bought. My piggie would love this hideout. I recently adopted him and he’d love a new bed for his first Christmas. My girls are lukewarm about the hammock I have in their cage (although they love hiding *under* it), but they love crawling into things and would go wild for a hammock like this! Butch and Sundance would very much like to snuggle in one of these! My two little piggies would love one of these, they love to hide and cozy up to each other. My chinnie would love to win this as she is an older girl and feels the cold in the winter. She would snuggle up in the hammocky hideout and I’d hardly see her all winter! 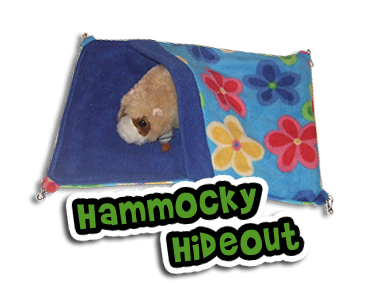 My guys would love a new product from Hammocky Hammocks!!! My gooeys, would love one of these to snuggle up in, that is if they don’t fill it with ‘buried’ food first. What a lovely Christmas treat it would make. My ratties would love this 🙂 All 7 of them love hammocks and they all like to squash in a big rat-pile in the same one, so you can only see various tails sticking out the side! My Mummy, Daddy and their 3 baby degus would love to all snuggle up in winter together in one of these! My chinchillas would love it and sleep in it and be lazy. It would be so warma and comfy for them to sleep in. It would be nice to sleep in for the winter time to keep them from being cold. My piggies would love this to snuggle in when I’m at work in the evening and it’s all dark and cold at home. Cos they are super funky and comfy! This would keep my little piggys warm this winter so fab!